An excellent mix of spices and herbs make this salt an original and unusual condiment to always keep at hand in the kitchen. 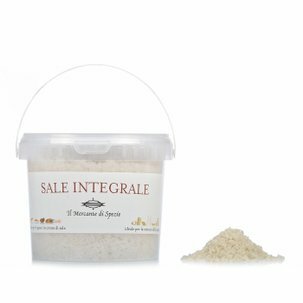 The salt of Il Mercante di Spezie is truly of the highest quality in that it comes from the salt pans of Trapani in Sicily where it is collected by hand to then be mixed with the spices. Add the spiced salt to meat and fish main courses and to flavour vegetable side dishes. Ingredients Food-grade sea salt 98%, Herb mix 2%: Provence herbs 40%, Fennel 10%, Coriander 6.25% Turmeric 5%, Caraway 5%, Onion 5%, Fenugreek 5%, Celery 5%, Nutmeg 5%, Ginger 5%, Black pepper 3.75%, Garlic 2.50%, Szechuan pepper 2.50%. ALLERGENS: CELERY and celery-b For more information on product labels, please contact our Customer Service department. The information on the labels of the products may vary for reasons beyond our control, therefore, there may be discrepancies between the information on the site and that on the products delivered. Please always check the information on the product before consumption or use.